This post comes from Andy Middleton – @gringreen. You can find out how to get involved at the end of the post! We’ve been waiting for long enough. We have a good idea of what needs to be done. We have the world’s best sustainability legislation in the Wellbeing of Future Generations and Environment Acts. A clear remit to leadership and change is set out in Prof Graham Donaldson’s Successful Futures report. With certain impacts from climate change, ecosystem health declining, biodiversity loss, plastic pollution and resource challenges ahead, we need new leaders more than ever. From the conversations happening on #networkEDchat, it’s clear that there’s a readiness for change. The scene is set. Now it’s time to act. We have many school leaders in the system here in Wales who are already involved in change ‘thinking and doing’. To highlight but a handful of examples there is Janet Hayward; headteacher at one of only two Ashoka Change Maker Schools in Wales. Dr Alec Clark driving forward the annual Innovation and Research Symposium and we also have Ty Golding; taking a leading role in the development of our new curriculum. 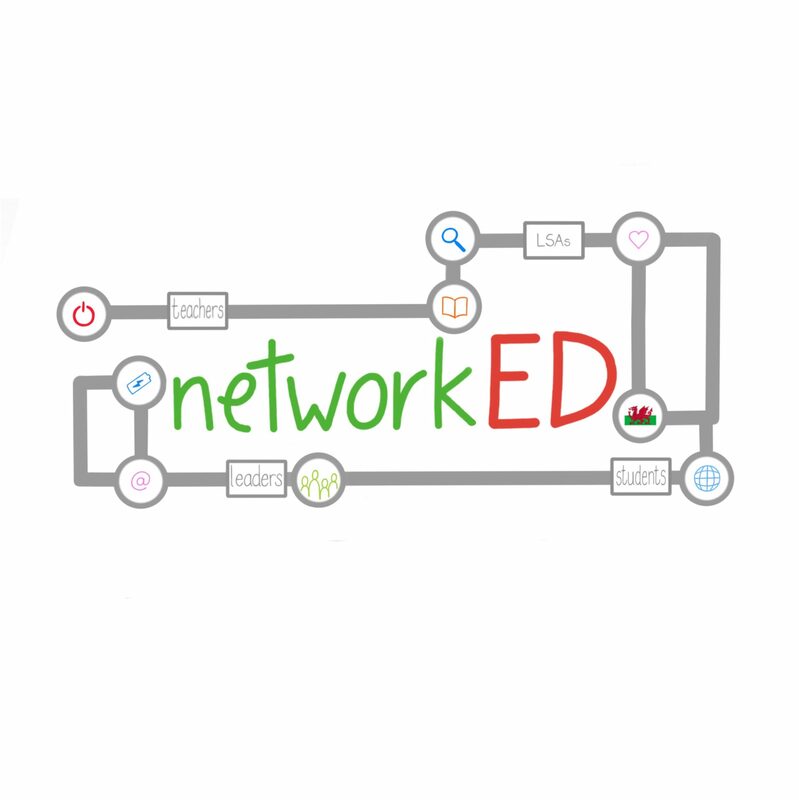 I am on a mission to find the first fifty head teachers and educators in Wales’ education system that are ready for a journey. We need to accelerate and experiment with possibilities on a 12 month ‘sprint’ to design and deliver education for a future that Wales and its citizens need. How far dare we reach with our ambition for change? What difference would it make if young people were better prepared for a life of employment and citizenship? Could we create a lifelong love of land, food and nature by weaving different experiences into the curriculum? How can we re-design adventure and residential experiences to connect with the learning that happens back in school? What blend of curiosity, knowledge, freedom and skills would best set up pupils to take over their school budgets for energy, water, buildings, food & transport? What support/process changes are needed to optimise the relationship between business, education and their future employees & leaders? As we ready for a journey that must be made, change frameworks from Otto Scharmer and Joseph Campbell can be useful. Presencing – asking yourself what is that you cannot do. What is change you would make if success were guaranteed? 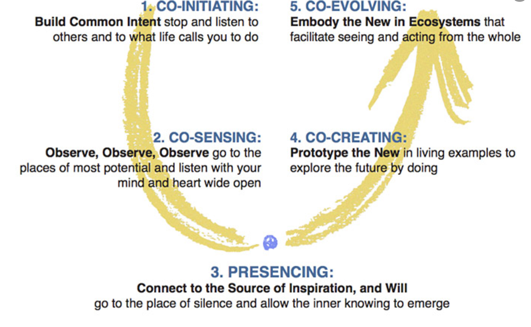 Co-creating – evolving new ways of working by involving different stakeholders who learn, share and grow together. Co-evolving – seeking conscious competence of the qualities that make new ways of working understandable and appealing to others. Some of you will already be familiar with Joseph Campbell’s writing and research on the Hero’s Journey. Stumbling Block: Continually second-guessing yourself and rotating in and out of the call to adventure and fear and uncertainty. Solution: If you are stuck, reach out for help. In almost twenty years of coaching, I have yet to meet a single person who was able to cross the threshold from the safe known world to the unknown world without help, guidance, or support from another person. It might be your spouse, colleague, a stranger, a child—regardless, they are instrumental in guiding you on your path and encouraging you to take the leap to the unknown. Stumbling Block: Viewing challenges as evidence that you should give up. Solution: You are being tested. There is something to learn in every challenge, yet your inner critic can translate a challenge as “See? Told you it wouldn’t work.” Reflect on the challenges you have experienced so far. What did you learn? e good news is that there is something to learn in every challenge. e bad news is, if you do not learn it, it will repeat itself until you do—and the lessons become harder each time you ignore the learning. Stumbling Block: Not reaching out for help. Solution: When you find yourself in an unknown world, there are a lot of new people for you to meet. There is a tribe of supporters, confidants, allies, and mentors waiting for you. You need them. And although you might not think it at the time, they need you, too. Being on the Hero’s Journey does not mean being a lone wolf. You will not see the change you want to see by walking this path alone. It takes the power of the individual AND the collective when you work at this level of change. We are all leaders. 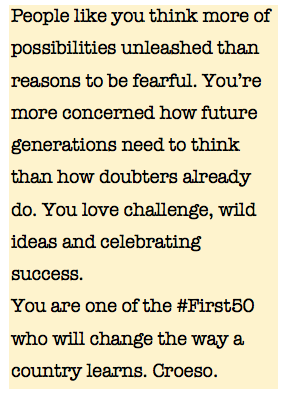 Are you ready to be one of the #first50? Nice message Andy to all teachers of children. Wouldn’t it be nice to have the politics and administrative constrictions taken away and have the freedom to have teaching return to teaching. Commitment towards action and striving towards a system which allows our children to experience an education that develops the ‘whole child’. In placing them in the best possible position to fullfill their potential and contribute fully towards our society and our planet.